logo done by giddy :: vote for the logos you like and be a lamah ! Fine for a firstie, and it makes me dizzy too! Very well done and nice color-scheme! rulez added on the 2008-10-20 10:07:14 by benny! thumb up for a nice firsty. but I think you could make it much smaller (even 256b). As far as making it smaller, I had a quick look last night and got 397 bytes. It can certainly be reduced further. Mhmm, a slightly beefed-up vertical star scroll? I didn't spend too long on crunching it down. An hour or so, maybe. I will try for 256b on my next release, for sure! 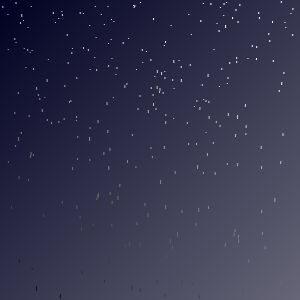 Parallax starfield thingy... Looks a little like snow. Andrew, you still in Melb? Coming to Syntax party? It's been what ... like 6 years? added on the 2008-10-25 17:38:51 by Bhl! page created in 0.015600 seconds with 15 queries.